Eyebrow Stencils are a fuss free way of creating your brow shape. The stencil is just a very flexible, seethrough sheet with the shape cut out and ready for you. All you have to do is paste. Making sure that you've got the right eyebrow stencil for your face is a matter of two things. The size, and then the shape that will suit you face. So How Bushy Should You Go? Firstly, determine whether you look better with fuller or thinner eyebrows. If your other facial features are heavy, such as your cheeks, nose and mouth, you will probably be suited by thicker eyebrows. Usually nature will have already done this for you, but sometimes she may need a little help. Now this doesn't work according to eye shape. For example, someone with big lips, and a square shaped face will look awesome with fuller eyebrows whether they have prominent, or small eyes. Perhaps you're coming from a space where you want to portray a certain message about yourself. According to ancient Chinese face reading technique, eyebrows can tell a lot about a person's temperament and ways of thinking. Thin eyebrows portray a highly sensitive person. So such people are easily hurt or offended. Thick eyebrows tell of a powerful thinker. Then depending on where the brows thicken, this communicates whether you are a powerful starter of things, or a good finisher. Here's a guide as to the best types of eyebrows for your face shape. Which Eyebrow Stencils Will Give You The Right Shape? Lets talk about eyebrow shapes. This is to say should they be straight, rounded, or have an arch? 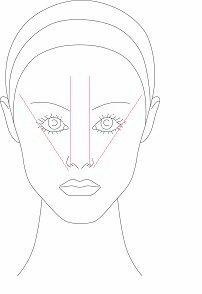 From a make-up perspective, the arch would be the highest point of the brow, and is the point where the middle of your nostril, and your pupil(when looking straight ahead), are aligned. Eyebrows that are mainly straight are said to show that you're faced -pun intended:) with a logical thinker. A person who likes to work with ideas. Curved eybrows portray a people's person, who mostly turn out to be friendly and likeable. So If youre looking for a sales job perhaps you'd want to create rounder brows for yourself. Then there are people with very angled eyebrows. These belong to those who like being in power. These people are usually in leadership positions because they like being in control. A brow stencil set will usually contain many of these different shapes. The question you must ask yourself is which one do I want to be? And which one will look good on me? Once you have found the right stencil, it's time to get shaping. 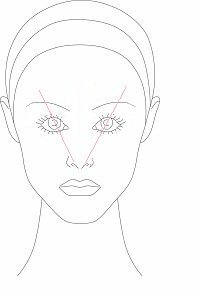 Ideally, the brow should begin at a point on a straight line along the side of your nose. This is shown below. The end of the eyebrow would then be aligned with a straight line from the outside of your nostril. 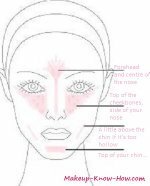 Mark these points, then place the stencil in line with the inside of the brow. If you have thin or overplucked eyebrows, you'll probably have to skip this step. With the brush, you are going to isolate the hairs within the stencil. Brush them all out so that all those outlined by the stencil shape are in the stencil hole. With the white liner, draw the shape of the stencil in. Any hairs outside of this line will go. Remove the stencil, then go on to either tweeze the hairs out, or thread them. Remove the white liner after plucking. Put the stencil back on, and use the brow powder to lightly fill in the shape. This is for more definition. Take off the stencil, and check wether you need more definition.